Before hiring any employees, you can get ahead of background check obstacles with a little planning. Creating a hiring and background check policy can offer consistency and reduce future efforts of hiring. Documentation will help your HR department of one to know what to do each and every time your company is ready to hire. The hiring process begins when there is specific need to fulfill or as requested by a manager within your organization. If your hiring manager has a job description, it will be easier when placing an ad or useful for recruiting activities. You may receive resumes and have job seekers fill out an employment application. It is vital that you provide the proper forms, especially when requesting consent for a background check, for your candidate to fill out. Another consideration, to reduce time and the risk of errors during the hiring process, is to use an online applicant portal. The candidate fills out all of the forms online and, after the interview and extension of a job offer, your hiring manager can request and view the screening results right in the portal. Watch the video below to learn more and see how it works. After the candidate has applied, the interview process is complete and the background check reports are ready, it is time to make a hiring decision. To remain compliant and to honor consumer rights as dictated by the Fair Credit Reporting Act (FCRA), your hiring manager must provide a written notice of pre-adverse action to inform the applicant of a negative decision due to the results of the background check. They must have access to review the report and dispute any inaccuracies before they can be denied employment based on the results. 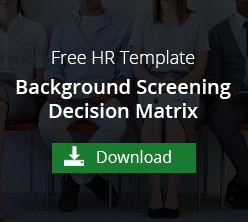 If they are unable to dispute the screening results, the hiring manager must still provide written notice of the adverse action. The hiring decision can be intensely scrutinized if your applicant chooses to fight it. Businesses, large and small, have been taken to court over the mishandling of the rights of the individual applicant. Working with a trusted screening partner, with FCRA-certified staff, is helpful to provide guidance during the process. Your HR team must also stay informed on any employment laws of your state or local government. Because hiring the wrong employee can be devastating to a small business, running background checks save money in the long run. By planning ahead, with a hiring and screening policy, established processes and working with a trusted screening partner, your company can also build best practices to ensure that the hiring experience isn't costly. To learn more about small business background checks, contact VeriFirst or schedule a demo to see how we can make the screening process a positive experience.